Nicole emailed to see if I'd like free sample bottles of the new Vlasic pickles. As most readers know I test out products when I have time and then let everyone know my honest thoughts (which can be a gamble). Since I'm on summer break, some pickles seemed like a good idea. 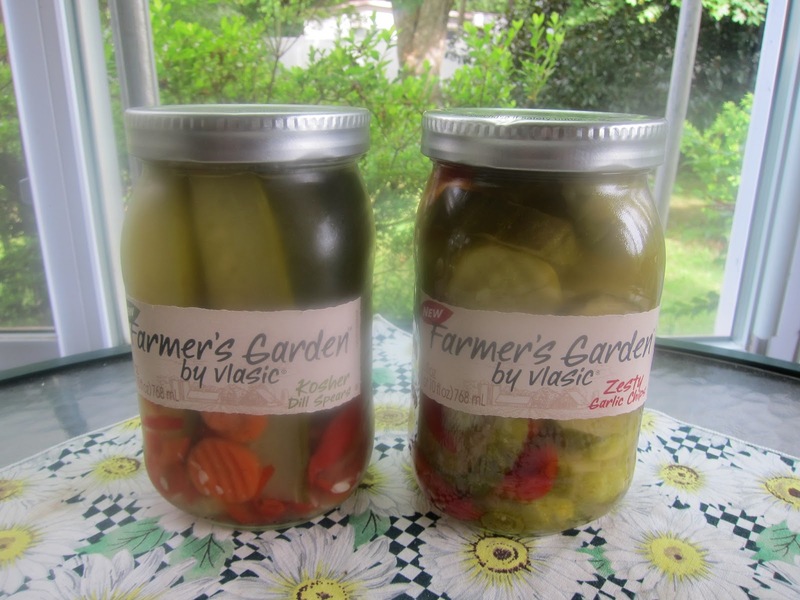 There are two new Vlasic offerings out in the Farmer's Garden line. One is a dill version so a rather classic style pickle while the second is a garlic flavored mixture. Although these would be billed as pickles, they also have other home vegetables mixed in like red peppers and carrots. 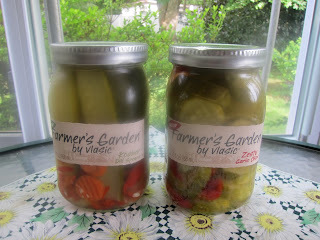 Both come in a home canning style jar which reminded me of Grandma and Mom's pickles. They always made various types of pickles with an old pickle crock. My sister backed up and sat in the crock once, and she got stuck. We were all kids so could not get her pulled out, so Mom had to come pry her out of the pickle crock. I love the looks of the wide mouth jars, but I must say I have some problems getting really wide lids twisted off the first time. My sister (the same one who sat in our pickles) bought me a gizmo that helps on that, so I was able to get the jar open without help (other than from the blue gizmo). The dill pickles were strips and had a nice zing and were good and crisp. The flavor was nice and did remind me of homemade pickles. I'm a garlic fan, so the thick cut rounds that they bill as zesty hit the spot. I am thinking about making some potato salad and cubing some. I suspect that would make really good potato salad with that extra garlic note. My favorites were the vegetables - the peppers and carrots. I've never been a huge fan of cucumbers, although I like pickles now and then and with sandwiches or in recipes like salads. I really, really loved the mixed vegetables, and I hope Vlasic will consider doing a jar with all pickled mixed vegetables some day. I already know I'm going to be a pig and pick out the peppers and carrots. The guys will humor me, because that means they get more pickles. While we were enjoying these really yummy pickles, my son came up with a grilled sandwich that called for pickles. I'd have to say it's one of the best sandwiches I've ever eaten, and the pickles really made the sandwich stand out. I call it Eli's pulled pork club sandwich, but some of my friends told me it's a Cuban inspired sandwich. 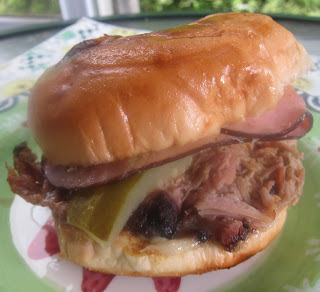 In any case, here is the sandwich, and you can also check out the Pork Club Sandwich recipe too if you want a really great sandwich with Vlasic pickles. I was curious about these when I heard about them. I thought it was odd not to have a jar of just the veggies like you mentioned.